Sometimes hypocrisy is so glaring it can almost physically strike you. It is of course no surprise to any of us that right wing thought is predicated on hate and a self-victimization. The right wing prefers to define themselves by what they hate as oppose to what they support. Of course they support various things; it’s just that the support always takes a back seat to attacking things they hate. When you combine this with their never ending struggle to make White First World heterosexual males the world’s most oppressed group, you end of with an ideology that is blind to its own hypocrisy. As some may know there has been a grass roots campaign to have the Rush Limbaugh show taken off the air for its racist, sexist, fascist, and homophobic content. It’s a small deal where activists call places saying they won’t listen to his show and tweet about him using the hashtag #StopRush. All of which is pretty mild typical weak liberal activism. The only problem is that it is beginning to work. The consequences for his show have been serious. In August he lost three radio stations in two weeks that were carrying his broadcast. Advertisers are dropping him as well. This is leaving a good deal of his operating budget coming from Koch Brother-owned organizations like FreedomWorks and Heritage Foundation. Over 3,000 advertisers have abandoned him via protests, boycotts, and petitions. In an effort to defend Rush Limbaugh, Breitbart writer Ben Shaprio penned an article where he decries how an activist from the “Stop Rush” campaign has fantasized about torturing Rush Limbaugh. He points to a piece of fiction written by Matt Osborn a big name in the “Stop Rush” campaign. In it he details violent thoughts he’s had about torturing Rush Limbaugh. Here is the sample that Breitbart gave. On the whole the work is quite odd even disturbing in some places. Regardless, it is only a work of fiction. I’m sure this bothered Limbaugh to some degree. Is this healthy? I doubt it. But who among us have not hated someone so much we’ve fantasized about torturing or killing them? Probably very few. Instead I’d like to look at the reality of torture as it exists in the real world, not in the works of an activist’s imagination. 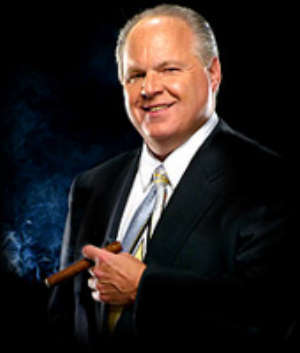 That reality is as follows, Rush Limbaugh has been a big supporter of using torture in the real world. You’re probably familiar with his ridiculous defense of such torture like the kind that took place in Abu Ghraib it back in 2004. Yes I’ve heard of emotional release, and for some people that is creative writing. The difference between the fictional torture of a person and the systemic actual torture based on religion and national origin for the purpose of false information gathering and pleasure should be obvious. One is a questionable emotional release while the other is a real life act of systemic oppression against a population for the purpose of plundering a countries’ wealth. If this difference is not visible to you, then perhaps it is you who needs to take a look at yourself. In true right wing manner Breitbart has managed to take a man who has supported some of the most inhuman acts of the global War on “Terror” and make him into a victim of it, to a lesser degree, in a work of fiction. In a true pathological mentality they seek to make themselves the victims as justification for their continuous attacks upon minorities, women, and whoever else. Those who wield the most power in society must make themselves out to be the targets in order to justify their disregard of criticisms of their unjust power. I’m sure in the mind of Ben Shaprio, Rush Limbaugh really is a victim. That alone says it all. It is only the First World mentality that could possibly see a White First World male millionaire as victim, not the innocent poor Third World people that Limbaugh championed the torture of.